That’s the one thing Brace Cordova is convinced of when he’s released from a five year stretch in a military prison. He figures the best he can do is spend the rest of his days as a freighter pilot and vicariously live out his dream of a Commonwealth Fleet career through his cousin, Commander Letessa Cordova. His plans unravel when he's accosted by gangsters, rescued by smugglers, and swept up in the search for an ancient Earth relic. With a vengeful crime lord and a Commonwealth Fleet gunship both hot on his heels, Brace soon realizes he might not live long enough to ever get a taste of the quiet life. The Cordova Vector is book one in The Brace Cordova Space Opera Series. It's an action packed science fiction adventure filled with diverse alien races, ruthless criminals, dedicated soldiers, and millennia-old mysteries. If you like the idea of Han Solo in a Star Trek style universe, then you'll love C.Steven Manley's The Cordova Vector. 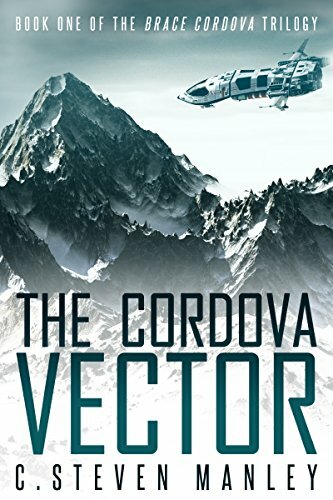 I was gifted the audiobook The Cordova Vector by C. Steven Manley. My review contains my own thoughts, and I'm not getting paid to say anything nice. This story is awesome on so many levels. It takes me back to the 90s when I watched Star Trek religiously. But it isn't a carbon copy of the Star Trek universe. It has a life all its own: unique and thrilling. The word Vector (in the title) is really where this universe stands in stark contrast to the worlds of sci-fi lore, such as Star Trek and Star Wars. Ships don't travel faster than light, but they do have a version of hyperspace. Navigating space is hard, and it isn't something that a ship can just do automatically, especially when you are traveling through uncharted space. Which is what most of the book is about. Brace finds himself on a ship that is looking for something that is believed (by one particular character) to be somewhere in the Black. What they find out there, though ... well, it's classic sci-fi but just as thrilling and exciting as any other good sci-fi story. It's predictable at times but not in an annoying way, at least not for me. It's those moments when you realize that things are coming together, and you should have seen it earlier, much earlier—the best kind of foreshadowing. A story can be unique while still staying true to patterns established by similar stories. If you can't already tell, I would whole-heartedly recommend this story. Obviously for fans of sci-fi. That's a no brainer. But I also think this works well for those that are curious about sci-fi but don't want to jump in so fast and hard as other books might require. It's a solid adventure. Great characters. Excellent performance (if you listen to the audiobook). 5 stars ... hands down!